We’ve all heard the complaints from oldsters: “Cars used to be so simple that all you needed to fix them was a couple of wrenches and a rag. Now, you need a computer science degree to even pop the hood!” It’s true to some extent, but such complexity is the cost of progress in the name of safety and efficiency. And now it seems this complexity is coming way down-market, with this traction control system for a Power Wheels Lamborghini. While not exactly an entry-level model from the Power Wheels line of toddler transportation, the pint-sized Lamborghini Aventador [Jason] bought for his son had a few issues. Straight from the factory, its 6-volt drivetrain was a little anemic, with little of the neck-snapping acceleration characteristic of an electric drive. [Jason] opted to replace the existing 6-volt drive with a 12-volt motor and battery while keeping the original 6-volt controller in place. The resulting rat’s nest of relays was unsightly but sufficient to see a four-fold increase in top speed. With all that raw power sent to only one wheel, though, the Lambo was prone to spinouts. [Jason] countered this with a traction control system using optical encoders on each of the rear wheels. A NodeMCU senses speed differences between the wheels and controls the motor through an H-bridge to limit slipping. As a bonus, a smartphone app can connect to the Node for in-flight telemetry. Check out the build and the car being put through its paces by the young [Mr. Steal Your Girl] in the video below. The Power Wheels platform is infinitely hackable – from repairs to restorations to enhancements of questionable sanity, it seems like there’s nothing you can’t do with these little electric vehicles. Oh, boy. You know what’s happening next weekend? The Midwest RepRap Festival. The greatest 3D printing festival on the planet is going down next Friday afternoon until Sunday afternoon in beautiful Goshen, Indiana. Why should you go? Check this one out. To recap from last year, E3D released a new extruder, open source filaments will be a thing, true color filament printing in CMYKW is awesome, and we got the world’s first look at the infinite build volume printer. This year, The Part Daddy, a 20-foot-tall delta bot will be there once again. It’s awesome and you should come. We launched the 2018 Hackaday Prize this week. Why should you care? Because we’re giving away $200,000 in prizes. There are five challenges: the Open Hardware Design Challenge, Robotics Module, Power Harvesting, Human-Computer Interface, and Musical Instrument Challenge. That last one is something I’m especially interested in for one very specific reason. This is a guitorgan. Building a computer soon? Buy your SSD now. Someone fell asleep on the e-stop at a Samsung fab, and now 3.5% of global NAND production for March has been lost. Need to put an Arduino in the cloud? Here’s a shield for that. It’s a shield for SIMCom’s SIM7000-series module, providing LTE for a microcontroller. Why would you ever need this? Because 2G is dead, for various values of ‘dead’. 3G is eventually going to go the same way. A bridge collapsed in Florida this week. A pedestrian walkway at Florida International University collapsed this week, killing several. The engineering efforts are still underway to determine the cause of the accident, but some guy from Canukistan posted a pair of informative videos discussing I-beams and pre-tensioned concrete. It’s going to be months until the fault (and responsibility) will be determined, but until then we have the best footage yet of this collapse. It’s dash cam footage from a truck that rolled up to the red light just before the collapse. This is one that’s going to go down in engineering history along with the Hyatt Regency collapse. Need to test your app? Here’s a delta robot designed for phones. You would be shocked at how popular this robot is. Let’s build a robot that gets hot. Really hot — like three times hotter than McDonald’s coffee. Then make it move around. And let’s get the cost in at around $100. Sounds crazy? Not really, since that describes the cheap 3D printers we all have been buying. [John] found out the hard way that you really need to be careful with hot moving parts. The short story is that [John’s] Anet A8 caught on fire — significantly caught on fire. Common wisdom says that cheap printers often don’t have connectors for the heated bed that can handle the current. There have been several well-publicized cases of those connectors melting, especially on early production models of several printers. However, this printer had an add-on heater with a relay, so that shouldn’t be the problem. Of course, a cheap power supply could do it, too, but the evidence pointed to it being none of those things. As an avid “Haunt Hacker”, [Steve Koci] knows a thing or two about bringing high-tech to Halloween. Wanting to build a mobile robot that could accompany him to conventions as a demonstration of the sort of animatronic mechanisms and controls he uses, he came up with the idea of JARVIS. The original plan was to make a more traditional robot, but with the addition of an animated skull and some Steampunk-style embellishments, JARVIS is definitely the kind of thing you don’t want to run into on an October night. Construction of JARVIS started in 2016, after [Steve] saw the Agent 390 tracked robot chassis from ServoCity. With the addition of extra wheels and a custom track, he converted the Agent 390 into a triangular track arrangement which he said he’s had his eye on since “Johnny 5” sported them back in Short Circuit. There’s a dizzying array of electronics required to make JARVIS move and talk, not least of which is the “Banshee” prop controller. 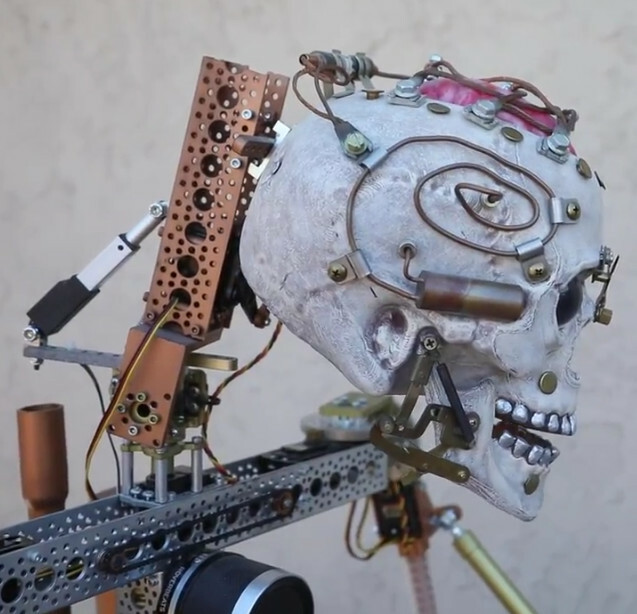 This device is made to simplify the construction of animatronic heads and provides not only organic-looking randomized movement but automatic jaw synchronization. Using a wireless audio connection, [Steve] is able to talk through a speaker mounted on the chest of the robot, while the skull automatically matches its mouth to his speech in real time. Combined with the GoPro in a two-axis gimbal, this allows JARVIS to function as a fairly robust telepresence platform. Much to the delight/horror of those it’s used on. Getting JARVIS to move requires not only the two beefy motors and a dedicated controller supplied by the Agent 390 platform, but no less than thirteen servos for the head, arms, and grippers. There’s even a linear actuator used to tilt the skull up and down, presumably for terrifying people of various heights and ages. JARVIS even has a pair of Adafruit’s electronic eyes mounted in the skull, as if you thought you would be spared the horror of seeing glowing eyes following you in the dark. 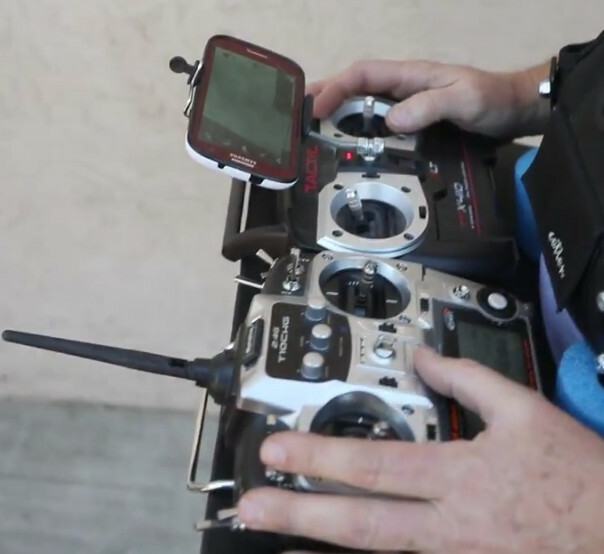 To control all this hardware, [Steve] uses two RC transmitters in conjunction with a smartphone displaying the video feed coming from the GoPro. It takes some serious finger-gymnastics to get JARVIS doing its thing, which [Steve] says he’s still trying to master. As many projects that have graced these pages can attest to, hackers seem to delight in coming up with new and exciting ways to terrify the young and old alike. Sometimes they can’t even wait until Halloween. Seven-segment LED displays have been around forever, it seems, and the design is pretty optimized by now. Off-the-shelf units are readily available in all sorts of sizes and colors, but if you want a really big display, you might have to roll your own. Scaling up the size doesn’t necessarily mean you have to scale up the complexity, though, if this light-pipeless jumbo seven-segment LED display is any indication. It’s clear that [Fran Blanche] has a thing for collecting and building oddball numeric displays, like this cathode ray tube Nixie knockoff or her Apollo DSKY electroluminescent display. 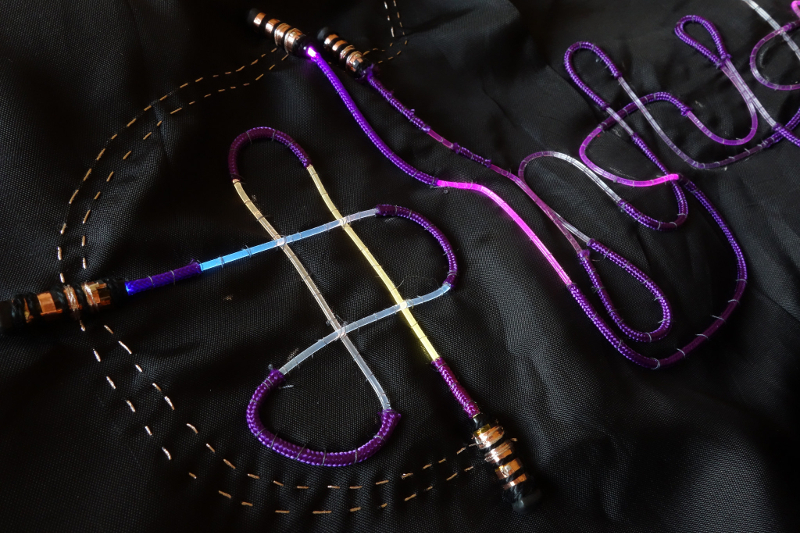 Her plus-size seven-segment display is far less complicated than either of those, and that’s by design; [Fran] wanted something that was 3D-printable as a single part, rather than an assembly with light pipes and diffusers. To that end, the display is just a pair of X-shaped dividers stacked on top of each other behind the display’s face. They dividers form six triangular compartments and a diamond shaped one, with each compartment opening into a segment-shaped window. One LED goes in each triangular compartment, while the double-sized diamond space gets two. That’s it — the LEDs light up the inside of each compartment to turn on the appropriate segments. Watch it in action below. The display still needs some tweaking, but it’s big and bright and has a large acceptance angle. What’s more, it’s scalable — imagine a display the size of a sheet of plywood using LED light bulbs. We’re looking forward to [Fran]’s improvements and her next display project, which appears to use hot glue as a light pipe.